Interseasonal Heat Transfer can help you address the key issue of combating global warming in a practical way that is in tune with the natural environment. Protecting the environment sits at the heart of sustainability. The built environment accounts for nearly half of the UK’s CO2 emissions. Innovative, green solutions for designing, constructing and using buildings are in urgent demand. ICAX answers that demand by providing Interseasonal Heat Transfer which heats buildings in winter without burning fossil fuels by exploiting Ground Source Energy. Surplus solar energy is captured by Asphalt Solar Collectors and stored in ThermalBanks in the summer for release into buildings in winter using a ground source heat pump. ICAX can help you achieve sustainability in the built environment by storing ground source energy in Thermalbanks and delivering ground source heat: space heating. 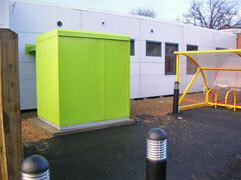 Ground source energy is a renewable source of energy which can be used for heating buildings. Architects, consultants and building owners have realised that ground source energy can be exploited the whole year around to provide significant reductions in carbon dioxide emissions and heating and cooling costs. 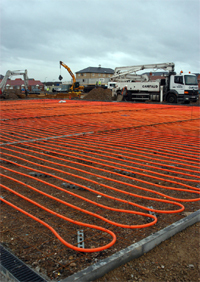 Heat can be extracted from the ground via fluid circulating through an array of pipes in the ground to provide heating to buildings in winter. The ground acts as a "heat source". 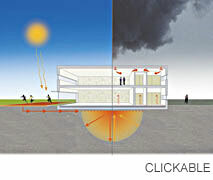 The ground can also be used as a "heat sink" for heat extracted from a building in summer in order to provide cooling. For the ground to be used as a ThermalBank in this way it is necessary to ensure that there is a balance of heat extracted and heat deposited in the ground over the course of the year. Thermal Modelling of the complete system is necessary to ensure that this balance is achieved in a sustainable way over the years. If heat is extracted for space heating purposes without any heat being deposited (from cooling the building in summer) there is a risk that the ground temperature will fall each year and the heat pump will cease to be efficient – it may even "lock up". 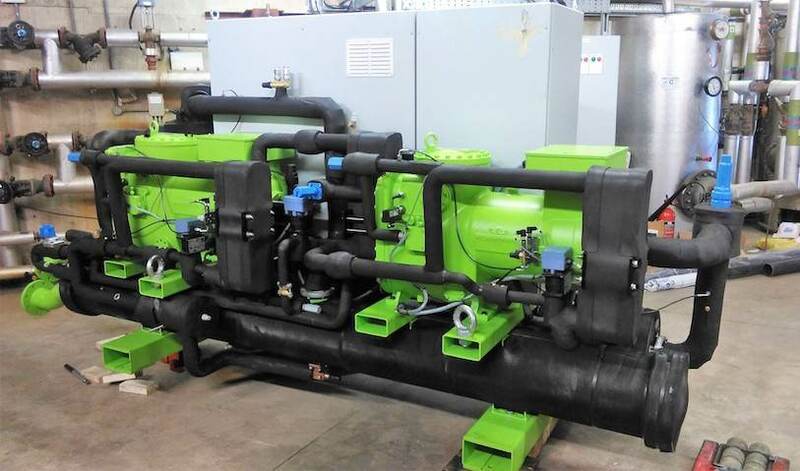 The solution is to collect solar energy in the summer and transfer heat to the ground in advance of the heating season: this is the essence of Interseasonal Heat Transfer and enables the heat pumps in an ICAX Skid to extract heat more cheaply and more efficiently than in an unassisted heat pump installation. Surplus solar energy can be collected in summer to boost ground source energy in winter by using Asphalt Solar Collectors or standard solar thermal collectors. The asphalt solar collectors can also be used as heat rejectors to disperse heat in systems of Natural Cooling. The most effective combination is found in Interseasonal Heat Transfer which utilises ground source heating and cooling in one integrated system: Solar Assisted Ground Source Energy. Surplus solar energy can be stored in summer in Thermalbanks to boost the ground source energy available in winter and double the coefficient of performance of ground source heat pumps: Underground Thermal Energy Storage. Having extracted heat from the ground using a heat pump, there are various different mechanisms for distributing heat within a building. Because a heat pump is most efficient when delivering warmth – at around 40°C – instead of heat – at around 70°C, it is best to use a distribution system that matches these lower output temperatures. Underfloor heating is ideal, but other options like TermoDeck and VRF fan coil units can also be very effective, as can direct supply to air handling systems. Ground source cooling can be used to cool buildings. This approach can be less expensive than air conditioning which provides cooling by heat exchange with external air – often hot air. Ground source cooling is a mechanism of allowing the excess heat within a building to escape to cold ground. This natural process is cheaper than using electricity to force heat out into hot air. The process of releasing heat to the ground also provides the useful function of heating the ground in preparation for using ground source energy the following winter to return the heat to the building from which it came. A well designed IHT system can achieve substantial reductions in running costs, energy use and green house gas production compared to gas based heating and chiller based cooling. ICAX combines expertise in thermal modelling and experience in installing GSHC systems to guarantee reliable and sustainable integrated systems with a high co-efficient of performance in winter heating and summer cooling in a well balanced system. The low annual running cost of IHT systems is further reduced to a nominal figure for non-domestic buildings by the introduction of the Renewable Heat Incentive from November 2011. Ground Source Energy systems can provide Reliable Renewable Energy. The mechanisms for providing ground source energy are very reliable and can operate at any time of day or night to control temperatures in buildings – irrespective of weather, tides, rain, wind, sun or seasons. A ground source heat pump uses the earth as the source of heat in the winter, and as the "sink" for heat removed from the building in the summer. For this reason, ground source heat pump systems are also known as Earth Energy Systems (EESs) or Ground Source Solutions (GSS).